Embracing Cybersecurity guidelines according to ISO/IEC 27032 helps you and your company to be prepared for the many cyber attacks that might happen. This five day intensive course enables the participants to develop the knowledge and competence needed to support an organization in implementing and managing a Cybersecurity program based on ISO/IEC 27032 and NIST Cybersecurity Framework. This training will enable participants to have an overview of Cybersecurity, to understand the relationship between Cybersecurity and other types of security, and stakeholders' role in Cybersecurity. This course can be used as guidance for addressing common Cybersecurity issues, and it presents a framework that enables stakeholders to collaborate on resolving Cybersecurity issues. 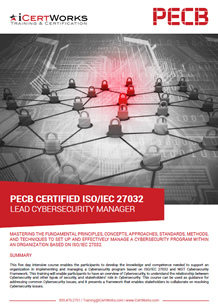 After successfully completing the "PECB Certified ISO/IEC 27032 Lead Cybersecurity Manager" exam, participants can apply for one of the credentials listed below, depending on their criteria. Contact us about ISO 27032 Cybersecurity Manager Training!